(CNN) -- NASA is not "overly concerned" about three small dings on the side of space shuttle Endeavour caused when foam debris fell from its fuel tank following liftoff, a shuttle manager said Thursday. 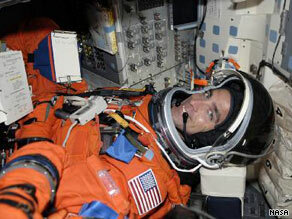 Mission specialist Christopher Cassidy sits insides Endeavour during a simulated launch countdown. The foam, on the external fuel tank, fell off in about half-inch thick strips when the shuttle lifted off Wednesday, said Shuttle Program Manager John Shannon. Although foam loss of that size is unusual, Shannon said, he did not think that it would cause much damage because the loss occurred late into liftoff. NASA video shows the foam tumbling into space after the shuttle left Earth's atmosphere. Officials have yet to complete their external inspection of the shuttle, Shannon said. They are using video of the launch to examine the incident. The shuttle is carrying a crew of seven and a key component for Japan's Kibo science laboratory on a 16-day mission. Kibo, also called the Japanese Experiment Module, is Japan's first human space facility and has been in the making for more than 20 years. Five spacewalks are planned for the crew once Endeavour docks with the station, but the launch delays will force the ship to undock early when the Russian resupply ship Progress arrives, launch integration manager Mike Moses said Monday. Astronauts aboard the international space station were busy cleaning up Thursday in anticipation. The multinational contingent of astronauts -- from Japan, Russia, Belgium and the United States -- "will spend the day packing and preparing for the arrival of visitors," NASA reported. "They'll review photography procedures for documenting the condition of the shuttle's heat protection tiles as it completes a rendezvous pitch maneuver during its approach to the station," a NASA news release said. Meanwhile, on board Endeavour, astronauts awoke this morning to the song "These Are Days" by 10,000 Maniacs obtruding from the crew cabin's speakers. The song was specially chosen for mission specialist Tim Kopra, NASA said. The Endeavour crew also had a full plate of chores to prepare for Friday's rendezvous with the international space station. Included are checking the heat shields with a robotic arm and inspecting the suits and tools that will be used in the mission's five spacewalks, the space agency reported. Endeavour's astronauts kicked off the day by firing an engine to "refine Endeavour's path toward the station," according to NASA. "A second burn is planned at the end of the crew's day." The crew also will install a camera in the shuttle's docking tunnel and examine a hand-held laser range finder and other equipment that will be used for precision distance measurements as the shuttle approaches the dock. Endeavour's crew will hit the sack about 10 p.m.
Friday's rendezvous will involve a tricky docking procedure, in which commander Mark Polansky will stop Endeavour about 600 feet below the station. Polansky will navigate a quarter circle around the space station, then begin the docking procedure as the shuttle and space station travel at about 17,500 mph, according to NASA's summary of the 16-day mission.